This post has been sponsored by Lagostina. All opinions expressed are my own. 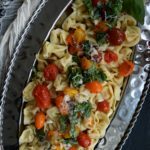 To celebrate the holiday season, we whipped up a batch of our favorite Four Cheese Spinach Ravioli and offering one LTG reader a chance to win a piece from the Lagostina Opera Cookware Set. Read through the post on how to enter! Decorating indoor evergreens. Praying for snow. Devising elaborate meals for the perennial feast. Searching high and low for a ‘unique’ gift…that you know is destined never to be used. Indeed, the ‘Season of Good Cheer’ is inescapably associated with things that simply defy rest, and are, very often, a hassle. Indeed, the season of good cheer is rarely for the faint of heart or those disinclined towards effort both physical and creative. Between decking the halls with boughs of holly, donning seasonal apparel, striking harps and joining the chorus, or trolling the Yuletide carol…whatever any of that actually means, the holiday season rarely gives one a moment in which to actually luxuriate in the ‘merriment’ of it all. That being said, amidst the noise and general rush of the season, reserving a few key traditions to oneself, or simply a few ‘nights off’ are…well I’m not going to say that they’re ‘essential,’ but they are certainly pleasant. Now, if you’re like me, and cherish the few quiet moments away from the rush, or find your fondest memories contained inside the moments set aside for yourself and those closest to you, then maybe this is one tradition you might consider picking up. I’m talking about the Holiday Movie Night, of course. Setting aside a night for precisely this is something we’ve been doing for a couple of years now, and we usually make a nice to-do out of it. 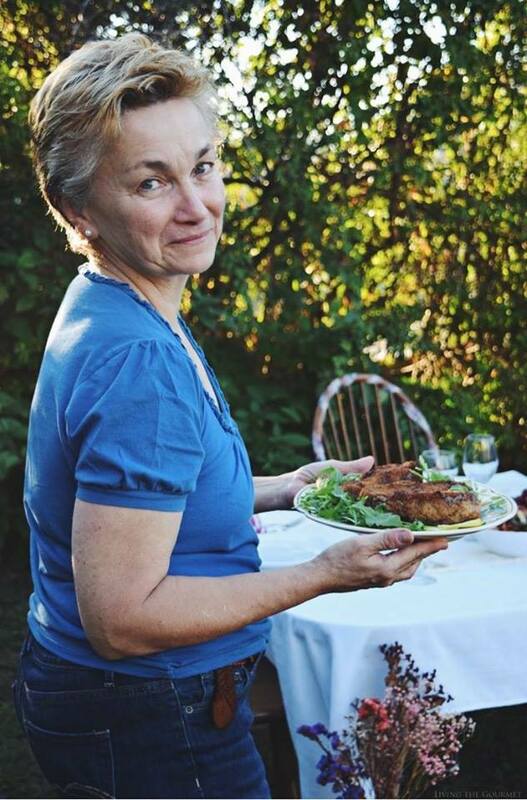 Being who and what I am, a ‘to-do’ of course is meant in only the most gastronomic of senses. 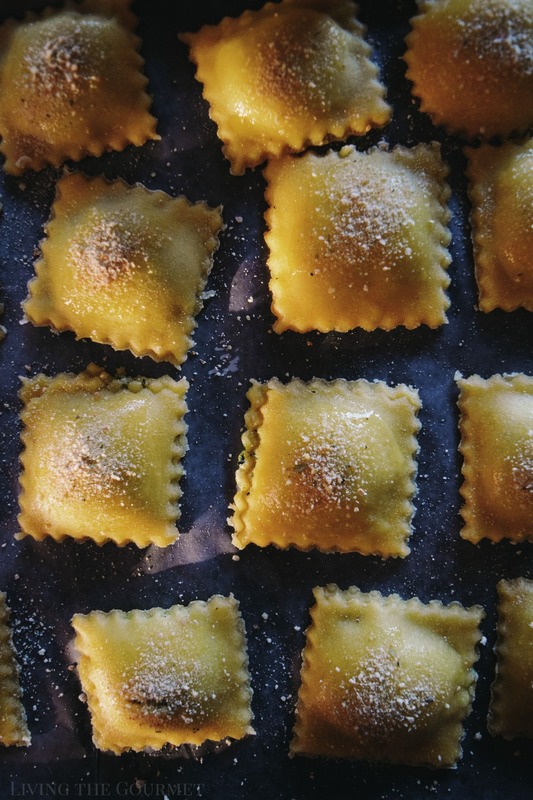 For example, this past Saturday was our Holiday Movie Night, and we had selected Roman Holiday as the night’s film, and what better way to make an event out of the evening than with homemade Ravioli? Naturally, that brings us to today’s recipe. To start things off, pour flour and salt into the center of a clean work surface. In other words, dirty up your clean kitchen counter. Then make a well in the center of the flour and add in the eggs, olive oil, and two tablespoons of water. Now, carefully whisk the eggs together, and once the flour has absorbed the wet ingredients, finish combing the mixture with your hands. Yes, now you’ve got dirty you clean hands as well. I never promised this would be easy. Tis the season, after all. Add in a tablespoon of water at a time as you do this, and once you have a firm dough, wrap it in clingfilm and refrigerate it while we continue with the rest of the recipe. Now, you know what’s coming, say it with me now, Heat a Large…nope, not this time. 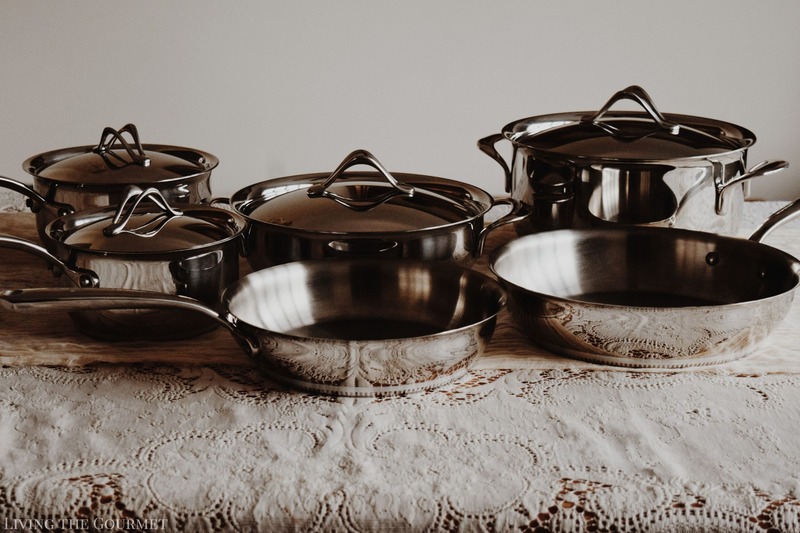 This time we’re giving our signature cast irons a break in favor of our shiny new set of Lagostina cookware. Yes, I’m a recipe developer with a shiny new set of a pots and pans. Why, I dare say I’m almost like kid at Christmas. Now, this isn’t merely any set of cookware, no these are 3-layer LagoFusion pans from my new friends at Lagostina. Constructed of stainless steel exteriors encapsulating an aluminum interior, you’re guaranteed both even heating and maximized durability. Oh, and if you couldn’t tell from the picture they are absolutely gorgeous. Ok, fine. I admit it. This year’s Holiday Movie Night was largely an excuse for me to use my new Made In Italy set tan pronto como sea possible. However, the original sentiment remains the same, and we still have ravioli to prepare, so let’s get back to it. 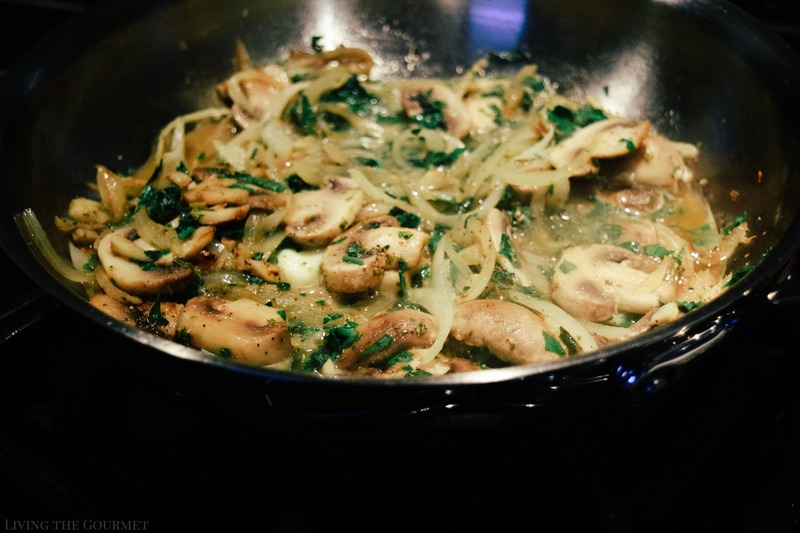 Now that you’ve prepared a Lagostina saucepan with a bit of olive oil, saute the onions, garlic, and mushrooms until the onions are clear and fragrant. 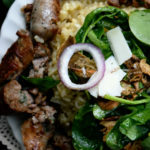 Then season with salt, pepper, and dried oregano, and add in the spinach, and continue sauteeing until the spinach has cooked down, and then remove the pan from the heat, and transfer the mixture to a food processor. Add the cheese and egg to the mixture, and pulse it until it’s thoroughly blended together. Feel free to set this aside…in fact, do set it aside because it’s time to get dirty again. Oh come now, I see that look. Feel the joy! Deck the halls and flour that counter surface, tis the season! 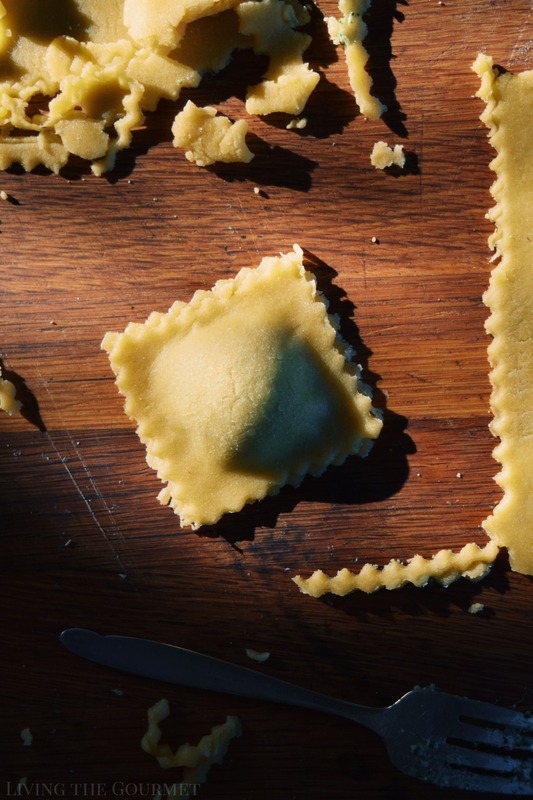 After dusting your counter with flour for the second time, divide the ravioli dough and roll it out to about an eighth of an inch in thickness…or bring out the heavy artillery and let your pasta machine do it for you. Be sure to follow the manufacturer’s instructions for maximized safety. We don’t want any fingers in the raviolis…lest we’ll need to add fava beans and a nice chianti to the recipe. Using a ravioli or cookie cutter, or simply the business end of a mason jar, cut out the desired shape and size of the dough…within reason, of course. Or not, feel free to go wild. Then spoon out about one teaspoon of filling into the center of each dough square, and then cover with another square, and press the edges down with a fork. Lay the ravioli on a lined baking sheet and let dry for about an hour. 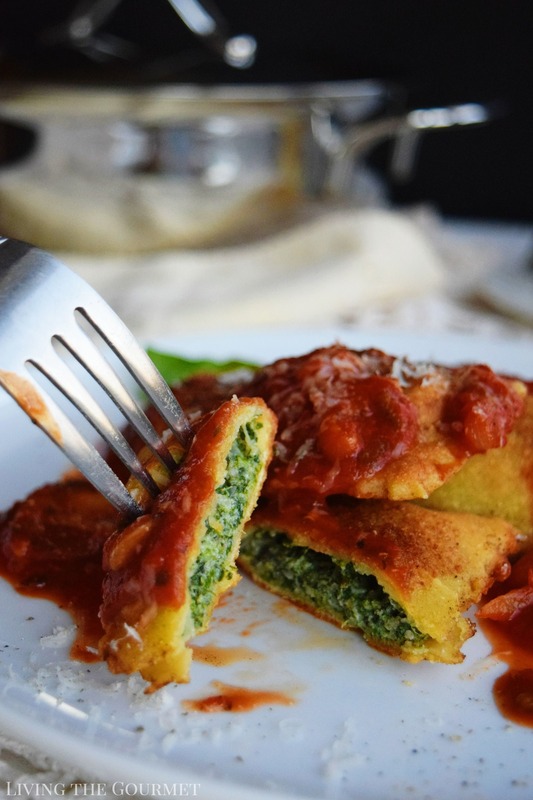 Nota del Cocinero: You’ll get about a dozen ravioli with plenty of filling left over, so feel free to double the dough recipe or make Spanakopita with the leftover filling. 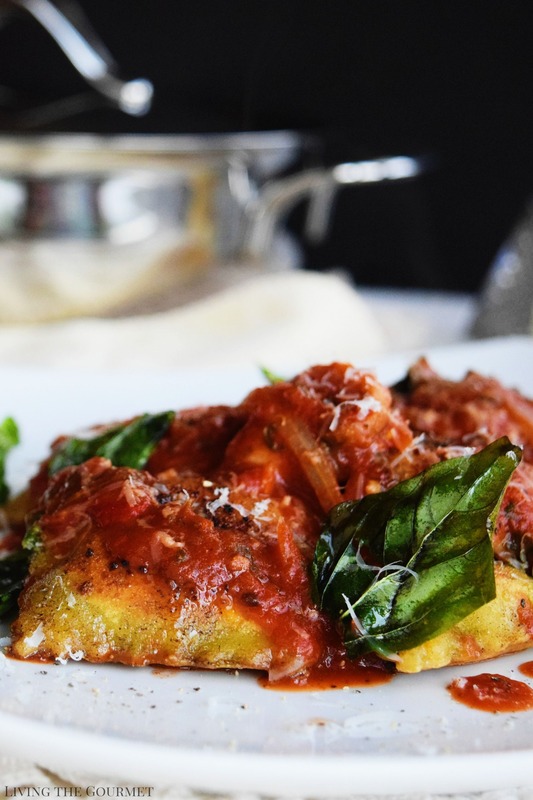 Before you fry them, brush each ravioli with a beaten egg, and then sprinkle with seasoned bread crumbs. Then, in a small frying pan, heat about an inch’s worth of olive, and then fry the ravioli about four at a time for three minutes on each side or until golden, transferring them to a wire rack lined with paper towels as they finish frying. 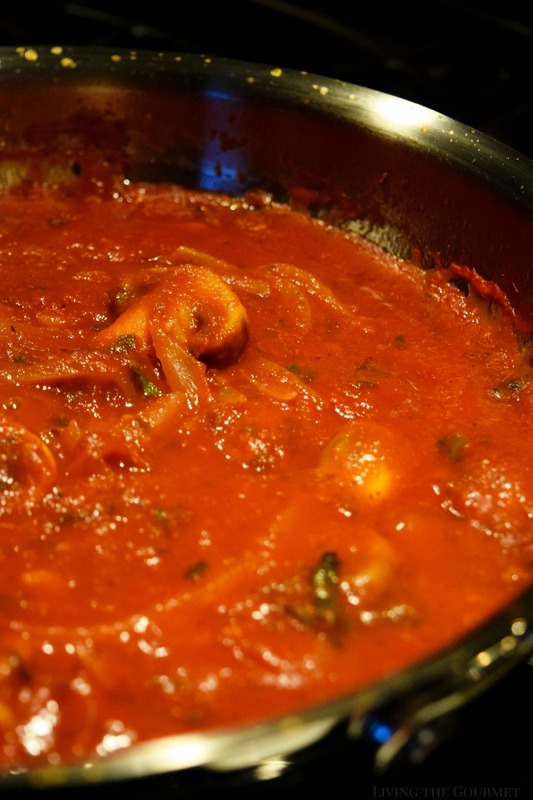 Now, for the sauce, feel free to use your favorite jarred marinara, or, if you’re feeling particularly ambitious, use my recipe here…which will give you the best results, of course. Pour the flour and salt into the center of a clean work surface. 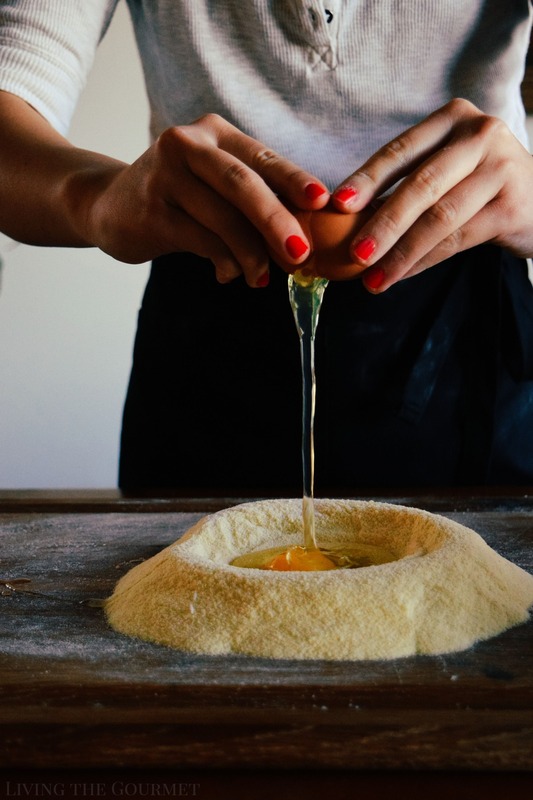 Make a well in the center of the flour and add the eggs, olive oil and 2 tablespoons water. Begin by whisking the eggs together slowly incorporating the flour. 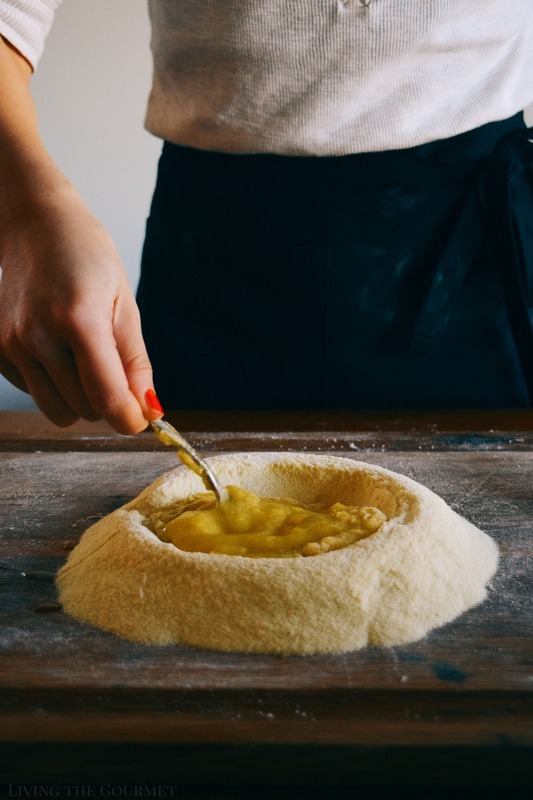 Once the flour has absorbed into the wet ingredients, finish mixing with your hands and begin to gently knead the dough until it has come together. Add the remaining water one tablespoon at a time as needed. Once you have a firm dough, wrap it in clingfilm and refrigerate while you prepare the filling. Heat a medium saucepan with a tablespoon of olive oil. Saute onions, garlic and mushrooms until the onions are clear and the mushrooms have cooked down. Season with salt, pepper, and dried oregano. Add the spinach and saute until the spinach has cooked down. Remove from heat and transfer to the bowl of your food processor. Add the cheeses and 1 beaten egg. Pulse until everything is well blended. On a well-floured surface, divide the ravioli dough and roll out to 1/8-inch thick or use your pasta machine and follow the manufacturer's instructions. Do this for both doughs. Use a ravioli or cookie cutter to cut out the desired shapes of dough. Spoon about 1 teaspoon of filling in the center of each dough square. Cover with another shaped piece of dough and press the edges. Lay out the ravioli on a lined baking sheet and let dry for about 1 hour. 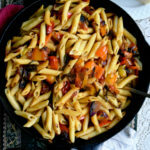 In a small frying pan, heat about 1-inch worth of olive oil. Add four ravioli at a time and fry for about 3 minutes on each side or until golden. Transfer to a wire rack lined with paper towels. Heat 10-inch frying pan with the olive oil. Add the sliced mushrooms, onions and garlic and allow the onions to become translucent and the garlic fragrant. Add the butter, basil leaves and the wine. Let the butter melt, then add the crushed tomatoes, seasonings and the grated cheese. Simmer on a low heat for about 20 minutes. 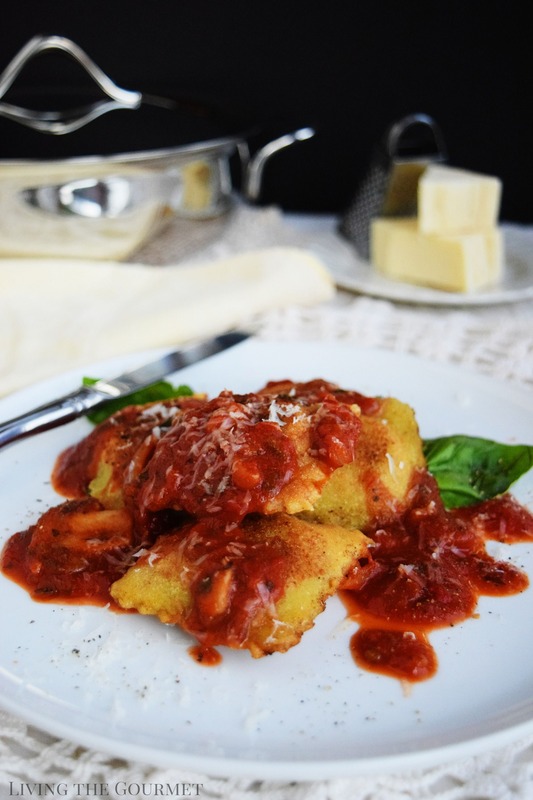 Serve over the ravioli with a sprinkling of grated cheese! 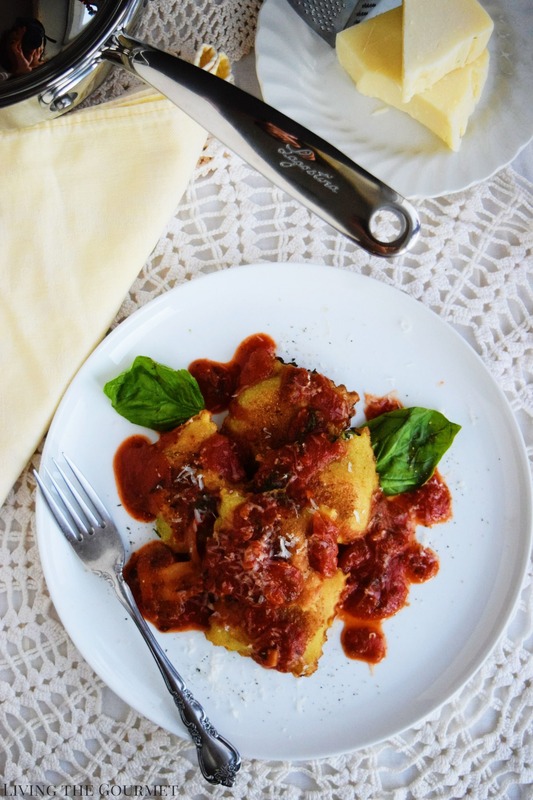 You'll get about a dozen ravioli with plenty of filling left over, so feel free to double the dough recipe or make stuffed shells with the leftover filling. After you’ve plated the ravioli with the sauce and grated cheese, serve and enjoy! Now for the fun part- One lucky LTG can enter on our Facebook page to enter one piece from the Opera Cookware Set from Lagostina. The instructions are simple. Just give Lagostina Facebook Page a like, then comment back on the LTG Facebook Page letting us know you did! Good luck! 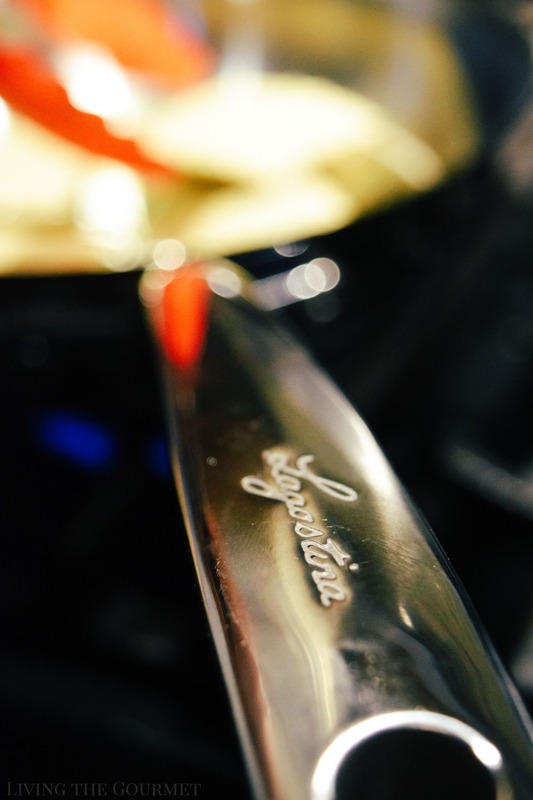 **The Lagostina Opera Cookware Set is available on williams-sonoma.com. Treat yourself or a loved one this holiday season and pick up this beautiful set today! 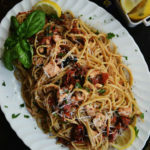 Making pasta is on my culinary bucket list. Not sure why I haven't done so yet, maybe I'll try it after Christmas! This looks mouthwatering! Thank you for sharing! Your photos are so pretty! I love the one of you dropping the egg into the flour well. My family makes homemade ravioli every year for the holidays... maybe I can talk them into trying a second recipe! Oh, this looks amazing! Restaurant-worthy! 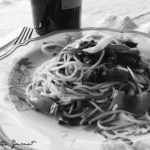 This sounds delicious and I enjoyed the article and pictures. Thank you for sharing. 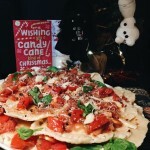 outstanding photos and the yummiest ravioli I have ever seen ... wow! This looks out of this world delicious! Thanks, i liked their facebook page! Looks delicious! I liked Lagostina USA Facebook page.